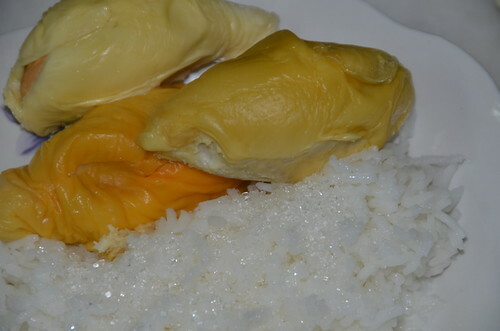 Durian season is here and our family traditional way of enjoying these king of fruits is to eat them with hot white rice, granulated sugar and a splash of fresh coconut milk. Hubby said the durians are not that expensive this year. He bought several brands like Khun Poh, Hor lor, lipan and cheh-kark (green shell), if I am not mistaken. The granulated sugar crystal, can you see them? We like granulated sugar as there is the ‘krak, krak’ sound when we savour the hot white rice, with creamy coconut milk (which has been added with a pinch of salt) and the heavenly durians. When we were in Cameron Highlands last weekend, we bought a habanero chilli plant. 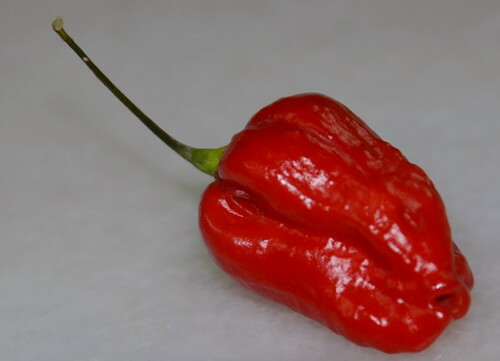 It is like one of the hottest chillies around, hotter than our cili padi, so it seems. 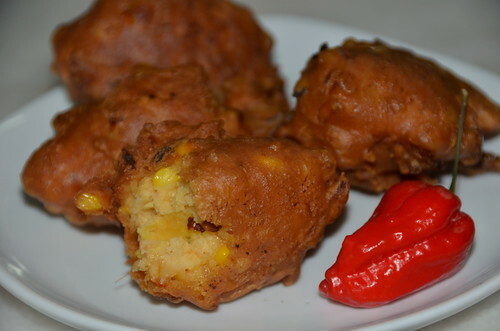 I have an extra ear of corn and made cucur jagung, Malay style. My son added in one tiny habanero and now, eating the cucur is a torture. 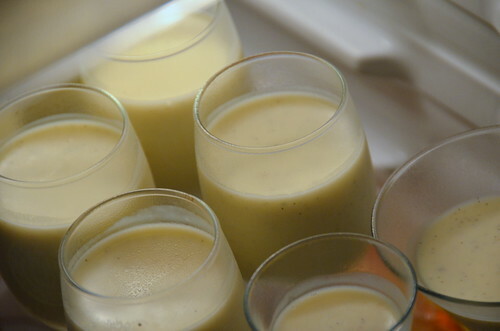 Fortunately, we have panna cotta which my son made with fresh vanilla beans I bought from Bali. The creamy panna cotta soothes the burning tongue. When we were in Cameron Highlands, we didn’t manage to buy any strawberry because the fruits were plucked and delivered to the stalls at 9 am. We left early. 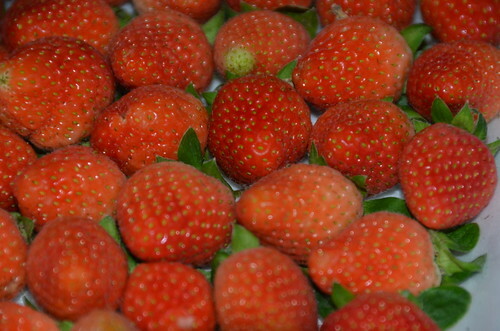 So, today we got to make do with strawberries bought from Mount Erskine market. 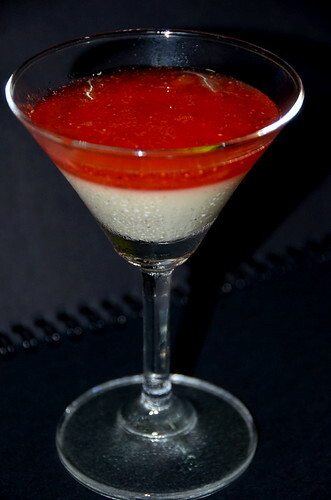 The strawberries sauce on top of the panna cotta. 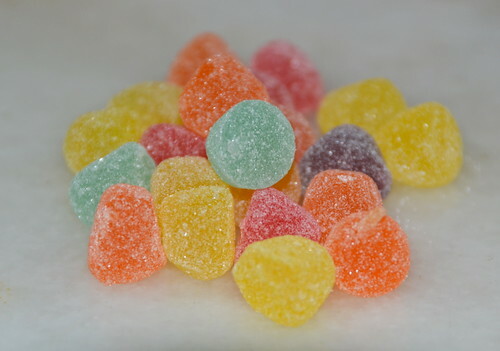 And here’s a bunch of gummy sweets which is on the dinner table so I take a photo too. I am pretty free, you see. All I do is to take pictures and eat, no work required, except for the mixing of the cucur jagung. I know taste is a personal thing but Charlie Brown still lousy, ok? I am a woman who like Durian very much. When I saw your photo of Durian, I really wanted to fly to Penang. 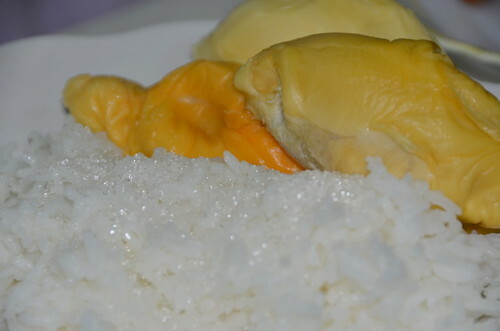 I’ve never tried Durian with rice. It must be nice! Two weeks ago, I bouth Durian from Thai at supermarket here. It was JPY2,980. I spent a lot of money for this fruit but it was not matured enough and not so nice. That’s why I am watching your photo wistfully.